Denim Day is a day-long awareness campaign that allows us to honor survivors of sexual assault and start conversations about the dangers of victim blaming. We have stickers, posters and ribbons available today! Stop by the Women’s and Children’s Alliance at 720 W. Washington street in downtown Boise. Order materials for Denim Day at our online order form! 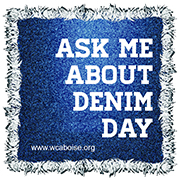 Wear denim or, if jeans are not an option in your your work environment, wear a “Ask Me About Denim Day” sticker, denim ribbon or bracelet on April 24th, 2019. Post photos, statistics, and info about local resources and share on social media with the hash tag #DenimDay and #WCABoise. Tag the WCA’s social media pages and we’ll share your photo as well! Questions? Contact the WCA Outreach Team at outreach@wcaboise.org.